I thought I'd better name this post, Completely Unrelated To Crochet, to warn you in advance that there is nothing remotely woolly about the next few paragraphs. 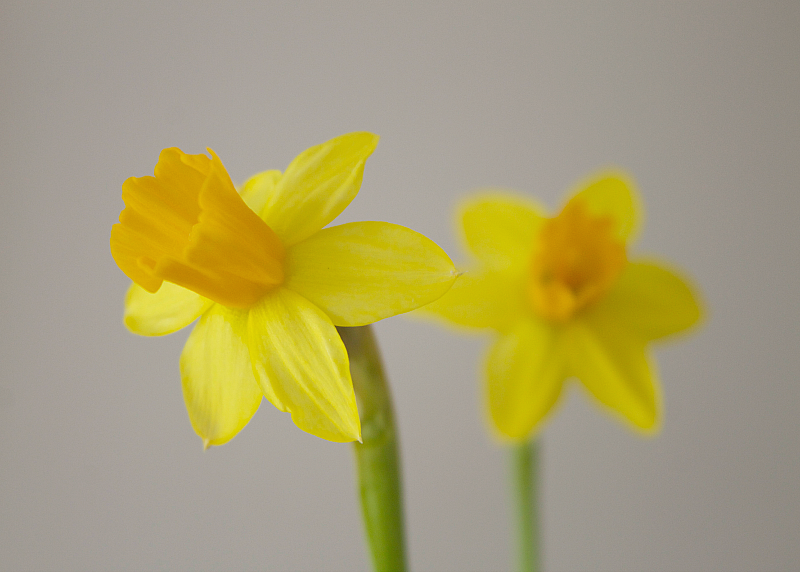 My narcissus photograph is deliberate too - you'll see why. One of the main reasons I blog is for self-expression and, if you've been with me for a while, you'll know that every now and again I feel the need to spill. I know I attract a lot of followers purely for my crochet, which I love, but my Instagram and Facebook experience to date has shown me that all it takes is one drunk selfie and they run for the hills! I admire hugely those bloggers who maintain an air of dignity by rarely eluding to anything remotely personal but I can't do it. I've tried but it's just not me. Fact. The truth is, I've been feeling very … ummm … Lost? Trapped? Whatever it is, it's been creeping up on me for quite some time and has reached a bit of a head in the last few weeks. I'm hoping that articulating it here and telling you will be a good thing. If it's not, it's too late now! Who knows, perhaps it might strike a chord with you? I'll try and be succinct. I am 43 years old and have been married for seventeen years. I met my husband when I was 21. I had my first child at 26 and my second at 29. My husband and I jointly made the decision that I should stay at home to look after the children which is what I have done. It has afforded him the opportunity to work hard (and he does) and also the opportunity to go away from time for some R&R (skiing, golfing weekends, Le Mans), knowing that I'm at home keeping everything ticking over. We haven't had the unconditional support of close family for a long time so help and babysitting etc. has been sporadic at best. Not helped by the fact that I'm rubbish at asking! So, in a nutshell, my life for the last sixteen years has been about my children, my husband, his work and our home. And, my god, it's been lonely at times but I've coped. I think. Until now that is. Something strange has happened. Perhaps it's a mid-life crisis?! I know I'm lucky in lots of ways. My husband adores me and my children seem to be happy and grounded. They are, however, teenagers and possibly because I have always been at home, do take a lot of things for granted. Including me. That said, they are gradually needing me less and less which is a very strange feeling. The thing is, I'm not sure who I am anymore. Or what I want. I don't feel valued. The monotony of my life is choking me and I can't breathe. I have this overwhelming desire to kick out, break things and sod the lot of them! Don't get me wrong, I love my little family to bits but it's not enough anymore. Or perhaps it's too much? I think I now need a big injection of something that is absolutely nothing to do with them. I need some fun. I need to be me. Not the mother. Not the wife. Not the daughter or sister. Just me. Out of desperation, I turned to a couple of treasured friends very recently and confided in them and I'm so glad I did. They each helped me more than they'll ever know. I think I need to feel interesting, vibrant, attractive and more independent again. What is it they say? You need to value yourself before anyone else will. Or something like that anyway. I hate the way my lack of sparkle is creeping in to my blog and other social networks. I want you to walk away from my posts with a spring in your step, not a heavy heart! I love my 'Pink Milk' identity - it's the one thing in my life that is wholly mine and I have no intention of changing it. I think I may well have had a meltdown before now if it wasn't for you. Sadly though, you're not there when I shut my laptop lid! I'm not sure yet what the solution is but the first thing I have decided to do is go and get a job. The extra money will help of course but I need to be with people again. It frightens me a little because I'm not professionally qualified to do much and I've been at home for so long. Nothing ventured, nothing gained though and I can't do nothing. I'm not going to apologise for the 'me, me, me' nature of this post. Surely blogs by their very nature are selfish to a certain extent? I am going to thank you for listening though. If you can identify with anything I've said or have any words of wisdom, as always, I'd absolutely love to hear from you. Right, here goes, I'm now going to be brave and press 'publish'. Oh it sounds like you are going through it right now! I know how you feel. I, too, am a 43 year old mother of two who feels, maybe bored? Lonely? Pointless? I have two part time jobs from home, but not enough people interaction for them to help much. I also am wondering what to try to kick-start myself into being me again. I have been thinking about taking a class in something. A friend of mine trained to be a TA and just started her first job. Who knows what will work for you? But keep looking - you are out there somewhere. Not too long form now the kids will leave home and you have to think about who you want to be then. Don't feel bad or worried about airing what you are feeling right now. Sometimes talking to 'strangers' is extremely helpful! Take care of yourself and do what you have to do. It's YOUR time to shine! I totally get this! You are not alone in feeling like this - I know I do, and I'm sure there are many others too. My bears are just starting out at school, but otherwise this post could have been all about me. I wish I could give you some sage advice but I have no idea how to solve this. I struggle to know what to do anymore, I want to feel valued for being me, rather than as a labelled wife, mother, daughter, sister. Each of those roles are important in themselves, but I feel I am more than this. Who I was when I left uni, just doesn't match with who I am now - I don't find I'm satisfied by old hobbies, and yet I don't know what I want to do. I have lots of lifestyle envy I think, I've struggled very hard to articulate my feelings, until I read your post and then it was a lightbulb moment. Thank you. Don't apologise for this sort of post - its your blog to do with as you please. I look forward to hearing more about your thoughts on this and how you progress. I completely get what you're on about ... you are a bright, creative soul and now that you have put in the years as a Mummy you need to claw something back. When its really manic at work ( I part own and manage a Nursery school for 60 children ) I often think, 'oh for a week off work' but I KNOW for a fact that after a couple of days I would be crawling up the walls. We need people, and not just family people but friend people ! In the last couple of years I have even started having a few girls weekends away and they are the BEST fun, no kids, no husbands, no cooking. I often think all of us bloggers should meet up somewhere for a couple of days of crafty therapy - how cool would that be ! I am quite sure that around the corner there is the perfect job waiting for you - life is all about phases don't you think, and you are just coming into a very new and very exciting one. It happened to me too but I was unhappy as the children were growing up and would eventually leave and I wondered what I was getting out of my relationship with my husband apart from the housework, shopping, childcare etc. I decided that I did not love him and I had to leave. The hardest decision of my life but it led to lots of better things. Another husband, a different job and a new life. I don't have any advice but I'm glad to know that you're willing and able to change things in your life so that it can be more fulfilling. It's good to think of yourself first (or at least on a par with everyone else, which is something I really struggle with). Aaaaaaahhhhhh, chick ..... wish you were close so I could give you a hug. It will come. You have provided the fuel - it's just a matter of time that the fire starts and, you'll be on YOUR way. It will be a change of life for all, not just you, but keep at it and that initial bumpiness (shall I/what if/but/no way ..... etc) the road will be smoother. It's coming. We all go through this, and though it is hard and confusing to not be sure of what should come next, it is really a grand opportunity to see what we can be. Ah, I can relate to a lot of this! I'm the same age as you, although my kids are younger and I did work (in a very low-key way - we're talking 'job' not 'career' here!) when they were small. I've felt a lot better about myself since I decided to finish my OU degree, started pre-kids and put on hold while they were little. I'm not suggesting you should do that (unless you want to!) but it helps me to have something which is more than just a hobby, and separate from the domestic routine. I don't begrudge my kids or my husband any of that, but I do find I do a lot of the same things day-in, day-out, and it helps to have something that uses my brain and is just for me. I don't know if any of that is any help to you, but I did want you to know you're not alone! Why don't you try volunteering at a charity to see how you go. That way it can give you that boost and give you that something etc to put on your cv. You could just do a couple of hours and they would be very grateful. Good luck with whatever you decide. I love reading about you and love it when it's real. I was in your shoes last year. I had been a stay at home wife (even worked from home) for more than ten years, with only the cats and dogs to keep me company (no kids, and husband travelling for work most of the time and only coming home for the weekends). I did feel like something was missing now and then but couldn't quite put my finger on it. In April, I got a job, it was supposed to be "just" a job to help with the bills and allow me to have my own car but somehow, I've come to love it. I have wonderful colleagues, Mr and Mrs Boss are amazing, I love going to work most days (there'll always be the odd day, of course), and just recently, even got promoted. Having a new perspective and meeting a new challenge has changed so much, even husband says I'm oozing confidence these days. By the way, it's not the profession I trained for 20+ years ago, and it's not in a field I've ever worked in before. Mr and Mrs Boss just took a risk, and it has worked out fine for all of us. Don't know if any of this helps you. I guess what I'm trying to say is if you can, just try it out. Find a job, see where it takes you, and if you love it, keep it on. If not, try something else. You'll know what you need when you find it. Good luck to you. Heather, I can so understand what you say because I felt the same a while ago. I was an at-home mum to my kids for 15 years and found it difficult when my role changed as they grew up. Despite my qualifications I felt that I had little to offer an employer and felt very out-of-practice and lacking in confidence. However, I did a course and worked voluntarily to start with, and a year later I was offered a job as a teaching assistant part time. I've been working as a TA in a busy secondary school full time for 3 years now and find it very rewarding. I've grown in confidence and feel a part of things again. It's given me the confidence to do other things too and I've realised that what my youngsters need now is to see their mum happy and fulfilled so that they can get on with their own lives. I feel sure that you will adapt to your new role in time, and very much recommend voluntary work and short courses, as they give you something to put on your CV and show you that you have more to offer than you think. Your honesty is admirable, and your blog is never dull. Good luck with this exciting new phase in life! Having worked all my life, since I was 14, I can tell you that whatever one's life is, whether home, or working, or a combination of both, it will of course become stifling if following the same path year after year. I felt the same way you do, only about getting up everyday early and heading to an office to do the same thing over and over. Maybe take a retreat for a few days with your best girlfriends and discover the parts in your soul that want to grow and sing. You have my great admiration for all you do for your family and creatively. You have often inspired me. My humble thanks to you, and a sincere wish to find joy and renewal in life. Well, I think from reading through all the above comments you are left in no doubt that these feelings are v common amongst women who have given up their all for the good of their family and home - it does zap you of 'oneself' and presents loads of unanswered questions whilst at the same time, you know deep down that that decision taken all those years ago was THE VERY BEST ONE and has paved the way for your children. They will look back on the years you have invested in them and it will have shaped them into the beings that they are. My children range from 18 to 11, 2 are away from home(school/uni) and I do now get all the calls (a)when they are ill/what to take or do for the illness( b) confusion re products when my daughter is shopping for consumables.....funnily enough when financial advice is sought its always directed at dad! The advice is generally taken and observed! I spent years bringing up the family (4 children) full time athome and only a few years ago when the youngest was well settled at school, .....at first having no idea what I would /could do (not wishing to return to the professional career I took my very long 'career break' from)....did I venture out into 'work'. For me, I took a part time horticultural course during the day (allowing for the school gate pick up at 3pm!). It was the best decision, I took 8 modular exams and passed and now by pure word of mouth work part time(still around the family, but its MY little business) designing and planting gardens for clients - my total passion. I do something I love and people pay me for it, hurray! I could never have imagined this when I was often buried in the smoke of daily family life and clockwatching (washing/cleaning/cooking/animal care/ and all the dogs body stuff that only the person left at home seems to see ). It is lovely to have a few pennies in your purse that you earned by yourself, that bit really seems to help with the identity notion and it feels very satisfying too. Be kind to yourself , there's loads out there really- be it a new skill to acquire or simply a job that you can do - as someone else said, 'soft skills' are so highly valued by employers and sadly, so lacking in some people- a role/function can be taught to the right individual who is willing and able. I feel you just need time to think about what interests you, what you might like to do and how much time you want to devote to it. Tomorrow is a brand new day and you may see that light or spark in the strangest of places, just try to be open to it and if you think something good or nice is going to come from it , then it probably will. A friend of mine who loves books, started volunteering at a library and that led to a paid part time position too! I think someone else mentioned volunteering too, so I guess if that appeals ,it may be another avenue. Sorry, I have rambled , but I fully understand your feelings. Best wishes. Love this comment. You're so inspiring. Oh I know ex.act.ly how you feel as I feel the same way just now. Nothing new to talk about at dinner except how you organized the bathroom cupboard with ideas from Pinterest. I have been out of school for so long my degree is just about useless, and I feel all I am qualified for is filing papers or working in a shop. Thank goodness you hit the publish button, because I have felt much better reading all the comments from others who have gone through the same thing with a light at the end of the tunnel. Good luck my dear; I hope you find contentment in your new adventure and still find the time to chat with us about crochet occasionally. The friends I met each week when the kids were at secondary school went back to work so I don't see them anymore (we used to craft together, it was productive, creative, supportive and full of laughs). My other set of friends moved on without me because I was at Uni. We used to go out together on 'expeditions' and holidayed together, too. As much as I love my husband and family, I miss 'friends' to share crafting and days out with. Yes, i think that's what is missing! How very strange that I should read your blog for the first time today and read about my life. I am 50 this year. i have 3 children. The oldest has just gone off to University and I too have stayed at home with them. From the time my oldest was 6 months, my husband started travelling all over the world with work. Like your husband he has always had a baby sitter available for whatever outdoor "hobby" he happened to be doing at the time. We haven't had much family support either. I have felt invisible and lost and wonder what will happen when the children leave. The main thing i have found is to not dwell too much, try to get out of the house every day, (I always feel worse in the winter) to exercise and do something for myself every week, a little treat. We stay at home mums are so undervalued even by our own families. I'm new to your blog and so enjoy it. All I can say is follow your heart and here's a hug if it helps. Oh lovely Heather, I hear you. I think we can all identify with that feeling of our blog being so precious, so "ours", and sometimes a lifeline. I know what you mean. I am happy at home for now, but now both mine are at school i really feel like I should go back to work soon, to prevent a crisis when they leave home. I hope you feel happier and start to regain some of your usual sparkle soon. Hi Heather ...as others have already said ..you are not alone. Another one here that is still 'searching' for something ?? You are so lucky to have some close friends to support you. Sadly I have none or family either. This all sounds very familiar to me. I'll be 49 in a few weeks. We've been married 27 yrs & have one child, our son who was married over a year ago. I did basically the same thing...stayed home with him living out in the country with one car so it was very hard to go anywhere. But it was my choice to so & I really don't regret it at all. It's just very hard when your pour your life into your family & things change. But think how much harder it would be if your children still needed you constantly at the ages they are?! So you've done a great job! I think everyone needs to learn how to be happy with just themselves alone. Here are some things that have helped me: 1)My faith, really that has been my number one help. -2)girlfriends, When my son reached high school I began making an effort to connect & grow close friendships. I could see the loneliness of the future & I wanted to help myself through it. I joined a garden club because I love gardening more than anything & I began making lunch dates at least twice a month with different girlfriends -3)Voice your feelings to your husband, really, the kids will grow up & leave. I often commented to mine that I was worried about what our marriage would look like when we were alone again. Voicing it rationally let him know what was going on & we both made changes to reconnect more - 4)a puppy, as silly as this sounds my husband bought me an 'empty nest' puppy & she has really helped give me a reason to get up on the very hard days...plus she gives me a lot to laugh about. -5) grieve, it's ok to be sad, to grieve over the changes & losses but don't just grieve. Be sure you look for things to be thankful for, the accomplishments of your kids, having time to try some things you've always wanted to try, ect 6) help others - really, the best thing to do when you're unhappy with yourself is to help someone who is in worse shape. If your efforts fail, try with someone else. Being sad & lonely is normal & sometimes we go through months of having a hard time finding joy but facing that helps us get through them & heal. You MUST give yourself something to look forward to. for me it was hard to do that but it's not impossible. Plan a once in a lifetime trip, remake a room, grow a garden, volunteer at a school or work with animals...all of these things will help you focus on the good in your life. One last thought is diversify. I think we all need to learn that having our life wrapped up in one thing or person is not good for us. If something catastrophic happens with that one thing it's almost impossible to recover. So join new groups that are totally separate from each other & make friends in different areas - I have garden friends, church friends, school friends, club friends, neighbor friends ect. I only have about three or four very close girlfriends but by making good friends in so many places means I rarely go out without bumping into one of them & that always helps me not feel so lonely. You have just hit the prevebial nail on the head. I'm 45 like you been a SAHM and adored it but my youngest is 21 and like you I haven't any experience qualifications and have been thinking how do I go about a CV no jobs to write about! Experience at being mum doesn't count. Ok I can organise I have an HND in psychology. That's about it. And though I want to work it terrifies me as well, that's if I can even get a job? So I though mabe voluntary work can get me back in to the regularity of well work! Can't wait to see what you do with this and I hope that I too can repot bk something positive.. I really wish you all you desire I think now it's time also to think about you and a good idea have a little job know new people I cross my fingers for you!! I wasn't a SAHM I have always had to work and I certainly went through a guilt ridden stage because of that, that I was somehow letting my children down but certainly the big three are all adults now with the youngest celebrating her 21st in just over a week. I definitely found it harder as they left home my little nest became very empty, I want to keep them all safe and under my wing but that wouldn't have been right either certainly not for them. They are all very grounded strong characters and I am very proud as to how they have turned out. Don't get me wrong I don't always agree with their actions and the directions they take and will advise when asked if anything I find this element harder to adapt to that you can't just kiss a graze better and stick a plaster on it as they don't make a plaster big enough. But all these things are part of life's rich tapestry aren't they and you can't put an old head on young shoulders. I think you will find getting a job whatever it may be very rewarding it will be something that you have done just for you and even though your family do value you there are times no doubt that feel a little taken for granted so this will give you the opportunity to do something that is just for you and you will be full of pride when that first time someone tells you they appreciate the work that you do. It will be a little scarey and yes you will get the terrors but it won;t last once you get settled and I'm sure with your talents it won't take you too long to find your niche. I've recently come across your stunningly beautiful blog and have been enjoying it very much. So sorry to hear that you're feeling lost but thank you for sharing with us and what an amazing response you've had. I'm a mum of two young girls and until late last year had been working PT for a national mental health charity until funding cuts resulted in redundancy. Having worked there for 10 years and putting my heart and soul into the role, I felt completely lost too. After many heart to hearts, grumbles and moans, long coffee breaks and planning sessions with my colleague (who was also made redundant at the same time) we had the wacky idea that we'd set up our own website to share what we knew, have learnt, experienced and researched believing that so many of us go through difficult times at some point in our lives. So Work Smart Work Savvy - the place to come when work gets crazy, was born. We're not confessing to have all the answers, we're not trying to sell anything, we just feel that none of us should have to feel alone. Our content is driven by conversations with our readers and friends hopefully keeping it real and topical. We have a mini docu soap weekly feature where a 40 something working mum mum opens her diary and questions whether you can ever achieve perfect work life balance without going crazy! It's a twist in life that I wasn't expecting and one that excites and frightens me in equal parts but I guess sometimes as you have said you're doing, we just have to take the bull by the horns, make a decision and go for it. I wish you all the very best and can't wait to hear more about your adventure on Pink Milk. Well...you sound just about right to me. It is an interesting time of life in your 40s. I think it is a great time! And, I get what you are feeling, that your life may not be "enough" at this time. Teens are something else to raise and be around. On one hand they don't think they need you, on the other hand..they do more than ever! Perhaps a job will be good for you...and perhaps you will decide to stay home and work from there...whatever it is, I hope you are happy and content. And maybe a few girls away weekends would be a fun thing to do as well...let the man cope with the kids all on his own for a bit. Mummy needs to breathe....wishing you the very best! Sue. I do hope you can find something just for you, something that makes you feel valued and respected. I am so sorry to read about your struggles. I have heard this is a normal struggle that some stay at home moms go through. I am also struggling a bit with this. I will be praying for you. I've so felt the same. I'm 46 and went back to work full time 8 years ago after being home for 10 years. Im an estate agent and felt I was being pulled in so many directions and not doing anything right. Last year it all got a bit much and my sister forcede to go for counselling. I can't tell you what a difference it has made to my life. I wouldn't have if it were not for my sister but I can honestly say I am now the happiest I've been for years. It won't be for everyone but it has helped me enormously and I would recommend it. I'm pushing ten years older than you, met my husband at just 19, married him a year later, had my first child when I should have been sitting my uni finals, had three more kids by the time I was 30, home educated two of them, worked sometimes, stayed home with them all sometimes ... it was chaotic but it worked for me. I recognise the feelings you describe but they never lingered because there was always something else on the horizon, and I was always too busy with work - paid and voluntary -, studies, and family to worry too much about the boring, soul destroying stuff like sorting the bathroom cabinet. My advice, for what it's worth, would be shake them up a bit, leave them to do more for themselves while you do whatever it is you need to do to feel properly fulfilled. I may be writing about me here, not you ... but it's easy to fall into the trap of accepting other people's notions of normal and losing your individuality along the way. By the time they were teens my lot only had themselves to blame if their sandwiches were awful, they made them themselves and if they wanted cheese and chocolate spread together that was fine. A friend who hinted that that made me a less than perfect mother was soon an ex friend ... I suggested that she might be confusing love with encouraging dependency and she didn't like it. The time I saved not making sandwiches, etc. etc., I always did something fun with ... I joined a samba band once and had a ball ... there's nothing like hitting drums with sticks to make you feel better. It's a cliche but it's true that if you don't value yourself other's won't value you too highly either, so give yourself permission to get out there and do something different, even wild maybe, that will put your sparkle back (not that I'd noticed it was missing, but that's blogs for you). I just found your blog so this is a bit late, but want to add some more support. My life was similar to yours in all the significant ways. When my children were entering their teens I was feeling much as you are feeling now, but my husband (he's older than me) took an early retirement and suddenly everything changed. I went back to college to finish an art degree, then was lucky enough to find a job and put the kids through college. After adjusting to being in class with fellow (and more accomplished than I!) students whose parents were often younger than me, I loved being in school, having interests, activities and goals outside my role as wife and mom. And I derived an enormous amount of satisfaction, fulfillment and confidence from my jobs. Although the children missed having me at home and available 24/7, I like to think they were positively influenced by seeing me establish a goal and work hard until it was accomplished. You are an obviously accomplished, intelligent woman with some important decisions ahead; don't be afraid to value yourself and set high goals. Hello, I am new to your blog - I found you via a comment over at Coco Rose Diaries. This is the first of your posts that I have read, but I felt like commenting as it struck a chord with me! I don't have any children, but I have been out of work for the last year and almost-a-half and have been following my husband and his work - all the way to Australia as he transferred over there! So I'm here in Australia, with no Aussy work experience and my qualifications don't count over here. So I'm totally starting from scratch, after a huuuuuge chunk of time of not knowing what to do with myself, and I am really lacking inspiration to make a life plan, and lacking the confidence to follow through on ideas I do have. It's so hard looking for work after a little time out, so I know it must be difficult for you too. But keep at it, read lots of advice - I read articles all the time about how to make good applications and CVs, and eventually you find your best style and you start getting invitations to interview. And I just got my first job offer a couple of days ago, so the hard work pays off! I also day dream a lot, which I find helps me to work out what is important to me, and what directions appeal to me :) Day dreaming also helps me to keep my eye on the longer term goal, which helps me to focus on the short term stuff I need to do to achieve my goals - hooray for day dreaming! If you like the idea of doing a little study as well, check out MOOCs online (https://www.futurelearn.com/courses/categories seemed a good place to me - I've just signed up to one of these) MOOCs are free, and generally seem to last for just a few weeks, so they are not burdensome. No idea if this comment will help, but I think it's awesome that you have identified a disatisfaction, and are doing something about it!! I'm a huge fan of people who embrace change and work to improve things for themselves, it's a much braver thing to do than many people realise! !